FOUNTAIN VALLEY, California, August 25, 2011 (ENS) – The world’s first sewage-powered hydrogen fueling station is now open. Drivers of hydrogen-fueled cars can exit the 405 freeway at Euclid Avenue in Orange County, California and fill up with converted sewage waste that offers the equivalent of 70 miles per gallon. The fueling station is located at the Orange County Sanitation District’s wastewater treatment plant in Fountain Valley. The new fuel cell is a combined heat, hydrogen, and power system that co-produces hydrogen in addition to electricity and heat, making it a tri-generation system. 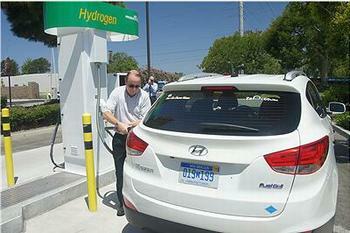 The hydrogen produced by the system is sent to a hydrogen fueling station that is open to the public. The new station is capable of producing 120 kilograms of hydrogen gas and fueling as many as 30 cars a day. The fuel cell also produces approximately 250 kilowatts of power for use by the wastewater treatment plant. This on-site approach to hydrogen production advances hydrogen infrastructure technologies that could accelerate the use of this renewable fuel. “Innovations like this demonstrate how American ingenuity and targeted investment can accelerate breakthroughs in the hydrogen and fuel cell industry while driving the clean energy economy forward,” said Department of Energy’s Deputy Assistant Secretary for Renewable Energy Steve Chalk. The Fountain Valley tri-generation fuel cell and hydrogen energy station uses biogas from the municipal wastewater treatment plant as the fuel for a fuel cell. The system is integrated with a hydrogen purification system to recover about 100 kg of hydrogen per day. “The Fountain Valley fuel cell system could offer a pathway to low-cost hydrogen and also demonstrates the versatility of fuel cells to utilize multiple feedstocks, such as biogas and natural gas, to produce power and renewable hydrogen that can be used to fuel light duty vehicles such as forklifts or as backup power in applications such as cell phone towers,” the U.S. Energy Department said in a statement. The new fueling station runs primarily on biogas, but the system can also use natural gas to sustain a consistent feedstock in the case of any disruption in biogas availability or quality.